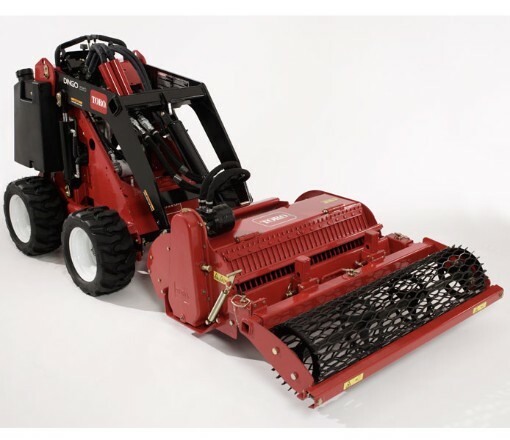 Looking to rent a Soil Cultivator attachment for the Toro Dingo in Rochester NY, Ithaca NY and Western New York? The Soil Cultivator Attachment is a widely respected Tool Rental item. Features a high filtering grate for excellent soil preparation and blending landscaping materials, compost and fertilizer. Notable offset wire mesh that acts as a finishing roller. Respected by professional landscapers for breaking soil at a depth up to 5.5 inches. Roller, Blade and depth control adjustment is performed mechanically. Number of Blades = 20 ‘V’ non-paning blades. Rotor Outside Diameter = 11.25 inches. Working width = 36 inches. Working depth = 5.5 inches.